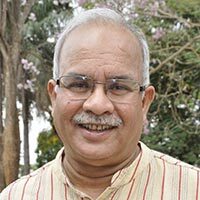 Ranajit Bandyopadhyay is a senior plant pathologist with 35 years of research and development experience in Asia, Africa, and the Americas. Currently, he guides research and development activities related to crop diseases and mycotoxins at IITA, Ibadan, Nigeria. Ranajit leads Africa-wide efforts on development and scaling-up of the aflatoxin biocontrol technology Aflasafe. His research on mycotoxins focuses on surveillance, bio-ecology of toxigenic fungi, integrated management of mycotoxins, and policy and institutional issues. Ranajit has authored nearly 175 publications. He is a member of the Steering Committee of the Partnership for Aflatoxin Control in Africa and chairs its Technical Sub-Committee. In 2010, he was named Outstanding Scientist in the first Annual Awards for Excellence for his research and advocacy work on aflasafeTM which has led to improved knowledge and awareness, more effective partnerships, increased advocacy, and greater impact for IITA.